Do you have a transom window that lets in a little too much light? 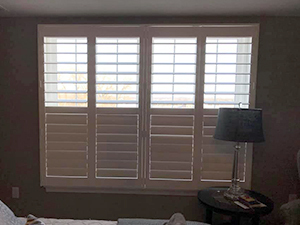 These room darkening Sonnettes were the perfect solution to complement the existing wood blinds in this master bedroom. They hold back the sunlight for some extra Zzzzzzzzzzzzzzzz. 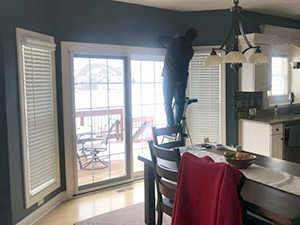 What's the best way to clean blinds? We are pretty proud of this one. Looking for the perfect solution for both the softness of sheer fabric and the functionality of blinds? Now is the ideal time to consider the softer side of blinds with Solera Soft Shades. Vignette Modern Roman Shades Project. 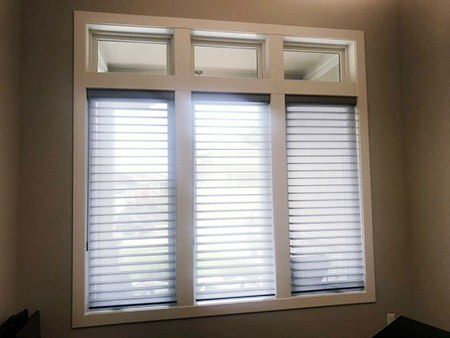 Switched out some aluminum blinds to these Vignette Modern Roman Shades. Quite a difference they made. Blinds and Shutters, What's the Difference? Consider a touch of leather in your next decorating project. Leather adds great texture and color to a room, and most leather design elements are practical, too! Beware though that leather can create a heavy look, especially in its most typical design colors, dark brown and black. Wood is a staple in interior design. It’s ubiquitous in the home environment and warms up a room with color, texture, grain and a touch of nature. Sometimes wood interior features sit in the background, and sometimes they take the stage as the focal point of a room. Often we think about vases solely as vessels to display fresh flowers – and it is nice to bring some of outdoor nature inside! But they are so much more. A coffee table shouldn’t be an insignificant afterthought near the end of planning your living room, den or great room. It’s a pivotal design element that can add drama and personality to your interior design plan.